On Friday Morning we visited the Sattahip Temple located 25kms outside of Pattaya as they held a thanksgiving ceremony for Songkran and to thank local residents for their assistance in undertaking renovations within the temple grounds. Every year sand is brought into the Temple in preparation for the rainy season which will soon be upon us. Sand is used as a temporary surface for the temple forecourt and other areas within the Temple Grounds. Heavy rains will cause the sand to wash away, therefore the sand collected during the ceremony is used during the rainy season to restore the uneven surfaces. During the festival, a sand castle competition is held within the Temple Grounds and other activities relating to Songkran take place. Cuddly Toy’s used to keep the Monkey’s away at popular Tourist Attraction in Sattahip. An amusing story now from the Lam Poo Jow Mountain in Sattahip which is a popular tourist destination. The area is known for its Monkey’s who live close to a shrine dedicated to Prince Chumporn. 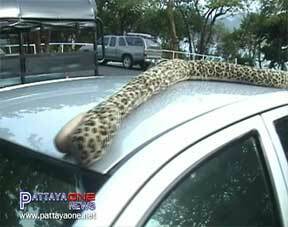 However they will often climb on cars and other vehicles and cause damage. When we visited the location on Friday we noticed that the Monkeys had disappeared thanks to a clever idea by Captain Gambana who is based at the Sattahip Navy Base. Now, when you arrive and park up you will be offered a cuddly toy to put on the top of your vehicle. The replica snakes appear to do the trick and no monkeys were seen. The Captain tells us this will work for now, however they will have to change the animal on a regular basis as they will soon realize that they are being duped.